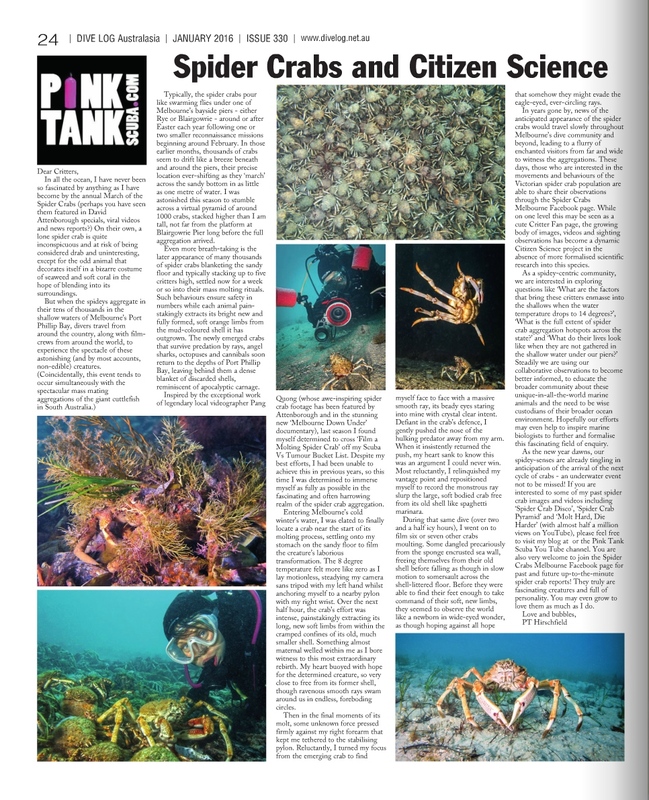 This entry was posted in Image Galleries and tagged adventure, Australia, Blairgowrie, cancer, crab, crabs, david attenborough, health, jacques cousteau, jean-michel cousteau, marine, Melbourne, Mission Blue, molt, molting, mortality, moult, moulting, nature, ocean, photography, pink tank, Port Phillip Bay, pt hirschfield, Rye Pier, scuba, scuba diver, scuba diving, shed shell, shell, spider crab, spider crab migration, Sylvia Earlie, underwater, video, water. Bookmark the permalink. Great to hear you this morning on Radio Marinara on 3RRR-FM Melbourne. I was worried that the timelapse moulting video was the one you mentioned where the crab was cannibalised by another spider crab immediately after moulting – particularly when that last guy stopped to watch for quite a while! Do you think there is actually a purpose to them watching another moult? The first one that stops to watch seems just a baby by comparison – maybe first moult? The second one looked like it was sizing up the moulter, waiting to see if they had a chance of taking it on. One more question: how long does it take for the shell to harden? SO COOL! One more thing for the to-do list (only a few more years until I get my daughter certified, and then I can finally have a real vacation again)!